Divisorization is not yet a word, but it is already happening in the malls. Considered the “mother of all markets,” Divisoria in Manila is known for an unbelievably wide range of goods at very low prices. In recent years, more and more shopping malls have adopted this formula—a wide range of goods at very low prices—bringing into the confines of their air-conditioned buildings a Divi-like atmosphere of noise and color, stalls and haggling. 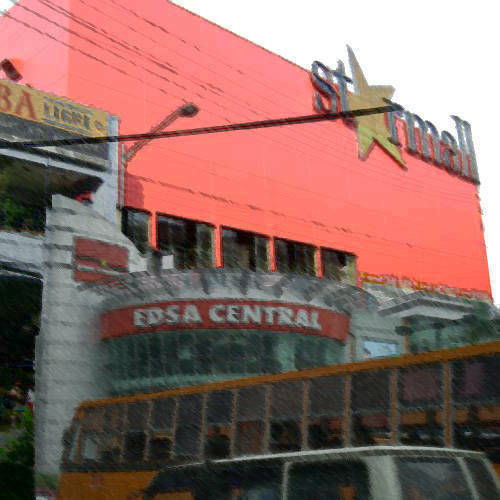 Found on opposite sides of Shaw Boulevard, Starmall (EDSA southbound) and EDSA Central (EDSA northbound) have been the tiangge centers of Mandaluyong City. At the first floor of Starmall, stalls are lined up at the hallway selling a mix of products including beauty supplies, home supplies, watches, bags, garments, native products like sungka (a native Filipino game) and other wooden crafts, packed kakanin (rice cakes) ideal for pasalubong, Chinese charms, and school supplies. The second floor sports a fiesta theme with stalls selling electronics, cloting, footwear, bags and accessories. Popular brands of jeans and beauty products have also set up makeshift stalls for goods on sale. The tiangge area occupies most of the space on the second floor, is surrounded by a few in-line stores, and is near the food court. Located along the mall’s atrium, EDSA Central’s tiangge is lined up with stalls selling pastry, jewelry, kids’ apparel, shades, electronics, charms and Chinese displays, books, beauty products. There are more in-line stores at EDSA Central, and receive almost the same foot traffic as the stalls.